Innovative concrete solutions provider Boligbeton lies just off the main highway in the Danish town of Løsning, a short drive south of Denmark’s second largest town of Aarhus. Boligbeton sought to refresh their image and used their location next to the busy E45 highway as an opportunity to do just that. The company wanted to give drivers a more positive experience rather than the mundane sight of a yard full of concrete elements and consequently turned to architectural design firm Pluskontoret Arkitekter for some fresh ideas. "Over 30,000 vehicles pass Boligbeton on the E45 daily, which gives the company great exposure,” states Suna Cenholt, architect and partner in Pluskontoret Arkitekter. “Our mandate was to assist Boligbeton to rethink its face out to the motorway. It’s really their shop window and has great potential for branding." Boligbeton treated the yard out to the highway more like a backyard, a somewhat messy, monotone area with little visual appeal. The bland stacks of gray concrete belied the company’s image however as Boligbeton is a dynamic player in what is actually a high-tech industry. Pluskontoret held an internal idea workshop in which a number of ideas were proposed to improve the yard’s aesthetics - reorganization of the yard and more colorful landscaping for example. It was the proposal of an illumination scheme onto the 140-meter long by 11-meter high façade that was the key factor however. Architect Daniel Olsen from Pluskontoret’s design team was already familiar with Martin and the possibilities that a dynamic illumination scheme could offer and consequently contacted Martin Scandinavia about a solution. After consultations with Boligbeton and a series of on-site demonstrations organized by Martin Scandinavia, the Exterior 400 Image Projector was chosen for the project. 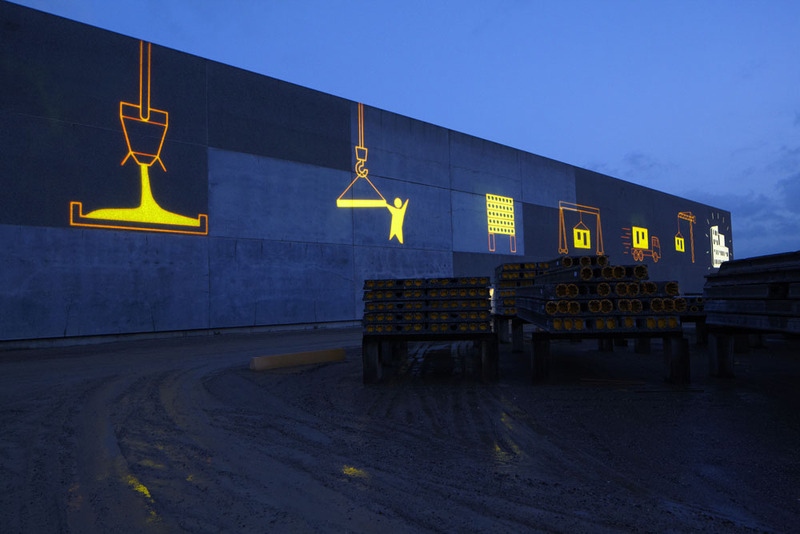 Pluskontoret use 10 of the outdoor luminaires to tell the Boligbeton story with each fixture projecting a custom-designed, static graphic onto the concrete façade. The Exteriors are mounted across four 4-meter tall masts at approximately 36 meters from the façade. Four fixtures project graphics straight onto the façade while six fixtures house distortion calculation graphics to compensate for angled projection. At approximately 6.5 seconds per drive-by, it takes several drive-bys to ‘read’ the entire 10-picture story. The lighting system is both dynamic and flexible and allows the company to project a different expression using new graphics and new story if they wish. Besides the Boligbeton story graphics, the fixtures can also spell out Boligbeton in text across the façade. The façade lighting scheme is controlled via a PC-based Martin M-PC™ control package with touchscreen interface. The network solution allows personnel to log on and control the lighting remotely from the Boligbeton building, from an office 500 meters away or anywhere.